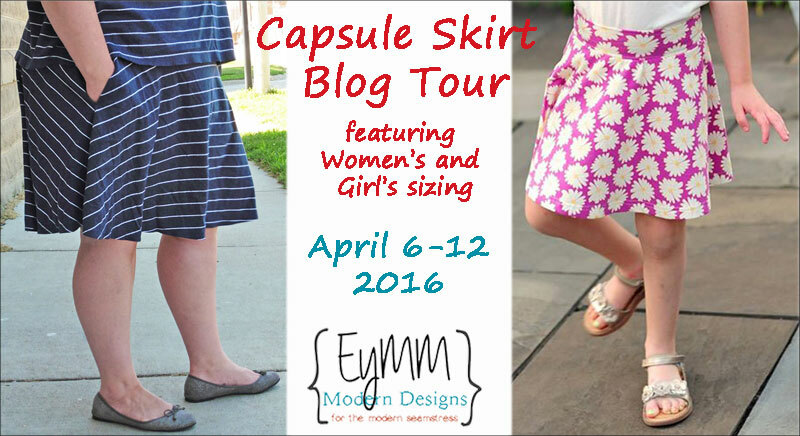 Capsule Skirts for Everyone! (or, at least for the girls, lol) – Everything Your Mama Made & More! And, of course, getting new skirts means we “needed” new tops to go with! LOL I’m feeling rather lucky that Kymy’s patterns are such quick sews. I spent just one afternoon cutting fabric and only one (long) evening/late night sewing up all six garments! My oldest chose a soft knit covered in forest animals that came from the Doodles collection at JoAnn’s for her Girl’s Capsule Skirt. Her skirt is a size 14 with 5(!) inches of length added. To go with it, I made her a coral-colored California Peplum (minus the elastic waistline, so it’s just a tank top). 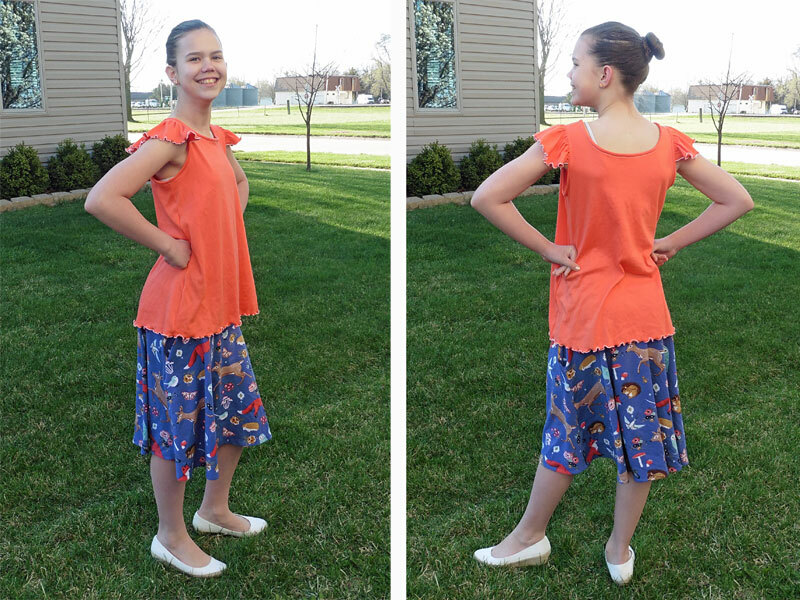 She wanted me to add flutters like I did for her sister’s maxi dress (<- follow the link for a tutorial) last summer, so that she could wear it to church without a shrug over the top. I love the simplicity of the solid coral mixed with the animals on the skirt. 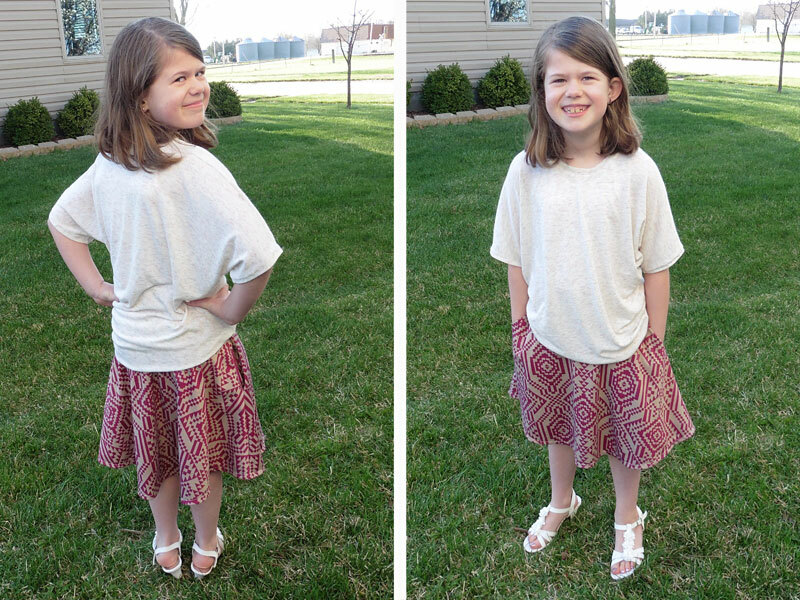 My younger daughter picked out this maroon and tan Ponte de Roma that I got in a Girl Charlee bargain lot recently. I thought this lightweight “Rainbow Heather on White Hacci Sweater Knit” (from the same bargain lot) would make a beautiful Asymmetrical Drape Top to coordinate. Once I pulled out my pattern, I was feeling too lazy to re-trace it one size smaller to fit her so I crossed my fingers and sewed the already-traced bigger size … and I kinda like the oversized-sweater look of the size 12 on her (it also leaves plenty of room to layer an opaque shirt underneath the sheer hacci). I’d set this mini-houndstooth cotton jersey aside for myself when it came in my Girl Charlee March KnitFix and I thought this would be a great time to pull it out and use it. After sewing up my skirt, I realized it’s a little thin for a skirt, but I love it anyways (I just need to layer some shorts under since it’s thin and light-colored). I made myself a simple Kymy’s Dolman Top from brown jersey to match the teal/green/brown houndstooth on my skirt. 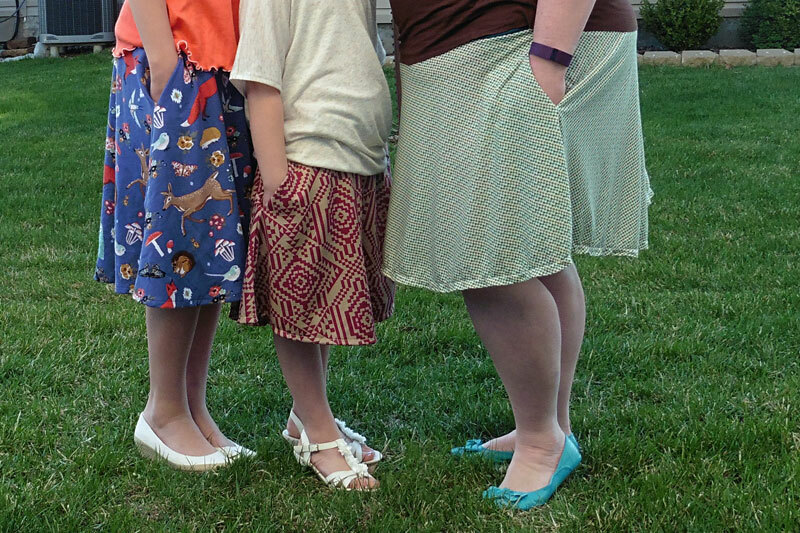 I like how the Capsule Skirt looks great with all three shirt styles! And can I just gush (again) about how I love the hemline options in the Capsule Skirt patterns? Cause I do … I really, really do! There are three hem curve options for every size so that you can have a perfectly level hem even if your body is “imperfect” (I use quotation marks because is anyone’s body really perfect?). You have the option to make a longer back to go out over a bigger booty or to make a shorter front if you like to wear your waistband under your belly. 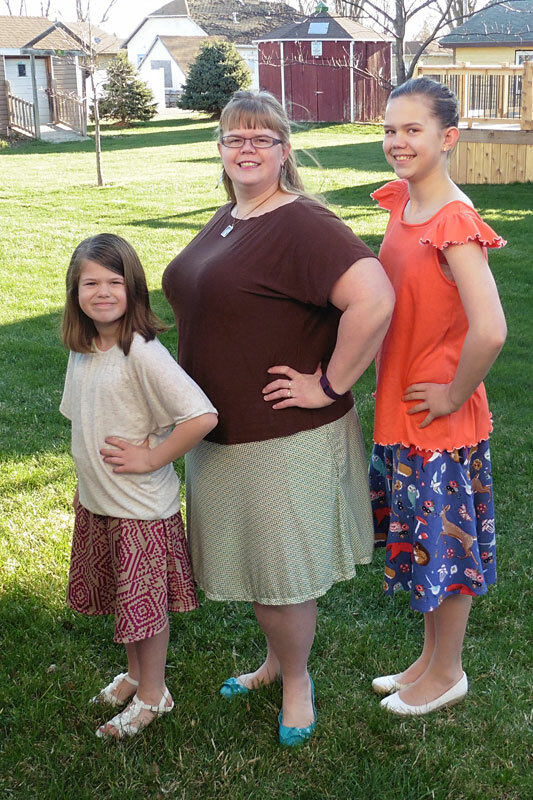 Since my girls and I all have fairly round bottoms, I opted to make the longer backs and normal length fronts on all three of our skirts. I love, love, love that we have hems hanging level with the ground! So glad you’re enjoying the tour! 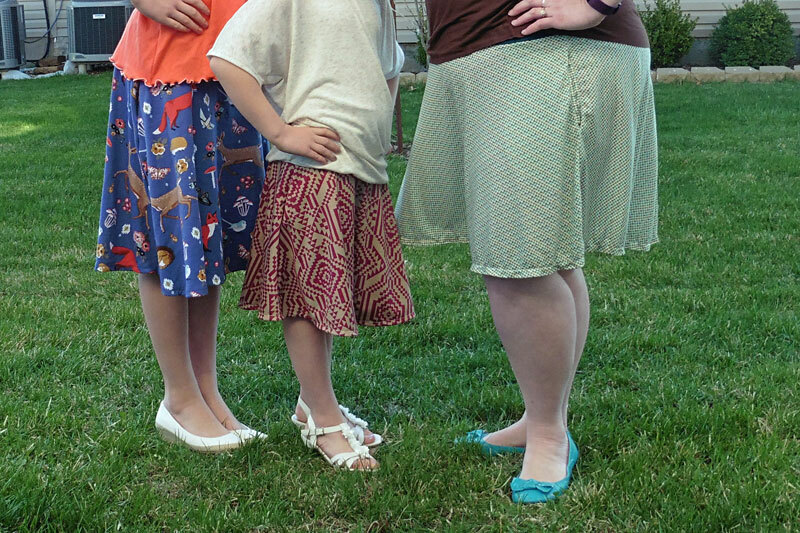 I love all the skirts this group of talented ladies have sewn!